I ran across an article today on MSNBC.com that proclaims the new Cadillac CTS is "The Cadillac of luxury sedans." And you thought Jalopnik was the fount from which all automotive irony sprung. It's true though, and I know you've heard it before, but in the 1950s a Cadillac was the el numero uno in the world. For it was a time when Mercedes was still trying to shake its image of Nazi tank builder, BMWs were slightly more fuddy than duddy and most Japanese cars had three wheels, if not less. Sure you had Rolls-Royce but they were just rebadged Bentleys with anemic straight-sixes and dodgy slushboxes. And Italy? Yeah, not so much. No, it was Cadillac baby, the self proclaimed standard of the world. Except for one car. And it was a Lincoln, kinda. The going was good in postwar America and Ford, like everyone else, wanted a bigger slice of it. In 1952 the then 26-year-old William Clay Ford (brother of Hank the Deuce and pappy to the current Billy Ford) decided to not only revive the Continental nameplate, but build something truly spectacular. The plan, simply, was to build the very best car in the world, price be damned. W.C. Ford brought all the big guns he could muster to the battle. John Reinhart led the design team, and if you've ever admired the 1953 Packard Caribbean you know who he is. The body was designed and engineered by Gordon Buehrig who designed the Duesenberg J, Auburn Speedster and Cord 810/812. William Clay's product had unimpeachable pedigree before anyone so much as picked up a pen. The only hitch was, Henry II hated the initial design. Not a problem, as William Clay brought in four other design teams to draft alternate proposals. Then, in an event likely unprecedented in the storied history of FoMoCo, a panel of judges was assembled to pick the winning design. Why unprecedented? Because the judges were shown the proposals alone, free from any knowledge of which project the big boss liked or disliked. Not shockingly with its (comparative) lack of bling and sleek Euro creases, Reinhart and Buehrig's initial, internal design was picked as best. So be it. You can't just say you're going to build the best car in the world and produce it on a standard assembly line. W.C. Ford was well aware of this, so he had a special factory built. The Continental MK IIs were essentially hand built to near ludicrous tolerances. Here's a few examples. The bodies were pre-fit to make sure that everything was hunky-dory, then disassembled and each piece was painted three times, lacquered twice, hand-sanded and buffed before being assembled. Each piece of chrome was given a 10-day salt spray test. Transmissions were individually tested before installation. The leather came from Scottish cows. Why Scottish cows? Because they don't use barbed wire in Scotland. Though the most insane extreme example of the new Continental's devotion to perfection was that all of the cross-head screws used to hold the windshield in place were hand adjusted to line up vertically and horizontally. All in all, there were 14 quality control stations throughout the factory. Obviously standard old Ford engines in the MK IIs would simply not do. So, the engineers cherry picked the best 6.0-liter (368 ci) V8s right off the Lincoln assembly line. These engines featured parts with the tightest tolerances and subsequently they produced the most power. The mills were then torn down and effectively blue printed for use in the Mark IIs. Power was given at 300 horses, but as each motor was essentially hand made this number is thought to be on the low side. Like the transmissions, the engines were also tested rigorously before installation. Lack of power was never an issue. Also of note is that each completed car was extensively road tested after assembly, before being shipped to a dealer. The compulsive attention to quality didn't stop once a MK II left the factory. Ford actually had a special team of field engineers brought together who could be dispatched anywhere in the country to fix problems. This sounds crazy until you realize what Ford was charging for a MK II. $10,000 in 1955, or about $80,000 in today's dollars. But even priced at 10 large Ford estimated that they lost $1,000 on each car they built. Remember, at the time a top of the heap Caddy cost "just" $5,000 and even a Rolls-Royce cost less. As a result, like so many of the cars in our Fantasy Garage, the Continental MK II became a must have for the richest in the land. Elvis had one, as did the Shah, Henry Kissinger and Frank Sinatra. So did Barry Goldwater, Ike, Howard Johnson, Nelson Rockefeller, Spike Jones, Louie Prima and the amazing Henry J. Kaiser. Not too shabby, huh? Ultimately though, the people that could afford the MK II bought one, and that was that. Ford originally envisioned selling 2,000 units a year, but they barely built more than 3,000 cars total before the MK II was killed off in 1957. 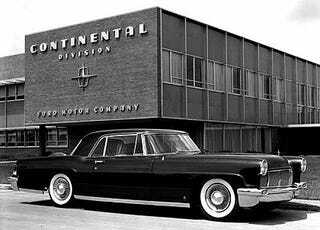 As was the Continental brand. Deemed too exclusive to be a Lincoln, Ford decided to create a whole new brand named in honor of Edsel Ford's V12 Continental. However, they were never exactly sure of the decision to create a new division, as the MK II carried Lincoln's four-pointed star on its hood ornament and Lincoln-signature spare tire bump. Regardless of whether you call it a Continental, a Lincoln, or one of the most amazing all time Fords, the uncompromising MK II deserves a spot in our Fantasy Garage. Happy Voting.